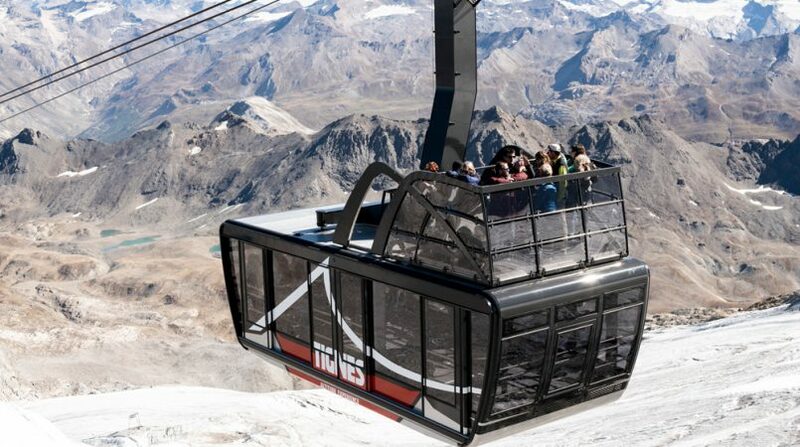 Located at an altitude of 3,032 metres on the Grande Motte Glacier at the gateway to the Vanoise National Park, the new Tignes cable car belongs to a new generation of equipment. Its two open-top cabins will offer passengers a unique 360-degree view of one of the most beautiful panoramas of the French Alps with views of Mont Blanc, the Cime de Bellecôte and the Aiguille de la Grande Sassière (3,747 m). This exceptional new cable car was designed to withstand the weather at an altitude of over 3,000 metres, blending in perfectly with its surroundings and offering passengers a unique view of the incredible natural setting. It will first open to skiers this winter once the ski area itself is opened. Due to extreme temperatures and heavy snowfall in winter at over 3,000 m, both open-top cabins will be open to the public in May. Created as part of a partnership between STGM and the Vanoise National Park, ALTITUDE EXPERIENCES is a “Unique, Fun & Educational” route that will start at the Tignes funicular station at 2,100 m and will reach the Grande Motte Glacier at 3,032 m altitude. ALTITUDE EXPERIENCES will open to the public in May 2019. It will be accessible to the general public, including people with disabilities. Between an elevation 3,032 and 3,456 metres, visitors will be able to enjoy the spectacular views from various altitudes as they feel like they are flying through mid-air. In addition, educational materials in various shapes and forms will provide information on this exceptional environment and ecosystem.